The first flavors that I pick up is a light salt, along with a lightly pungent spice. There's a bit of a spicy heat building, while a touch of worcestershire is detected. The chewing brings on a more savory marinade, where the worcestershire a bit of more defined but with clearly identifiable soy sauce behind it. The spicy heat continues to build, while that wasabi takes on more clarity. 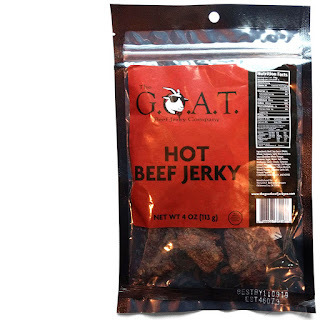 For being marketed as, "Hot Beef Jerky", the level of heat in this definitely seems to back up that label. It has enough heat that spicy food lovers in general won't be disappointed, enjoying enough burn to relish a decent degree of masochistic mastication, while keeping it toned down just enough to ensure non-stop meat-snacking pleasure. But that wasabi-cayenne tandem makes this quite interesting. You get the old familiar chile pepper heat that lingers on the top of tongue, but you also get that horseradish spice that lights up the palate without the residual burn. On our heat scale, I'd rate this as a "medium hot" (4/5). Otherwise, the primary taste profile is a more familiar worcestershire & soy sauce blend, with just enough of the tried-and-true blend of brown sugar, garlic, and black pepper, and even a moderate dusting of cayenne, but made more unusual with that pungent dose of wasabi. The wasabi doesn't overpower like the way it does in traditional sushi-condiment form, rather its more weak in spice, yet pungent enough to make this different. The meat consistency resembles that of sliced beef brisket, well marinated, with a soft chewing, and slightly moist. Like with most brisket-based jerky brands, it does have a light bit of stringiness, but otherwise, very little fat noted and nothing unchewable. It's fairly easy to chew. Once chewed down soft, it takes on a meaty feel, even somewhat steak-like, though lightly mushy. This Hot variety from The G.O.A.T. 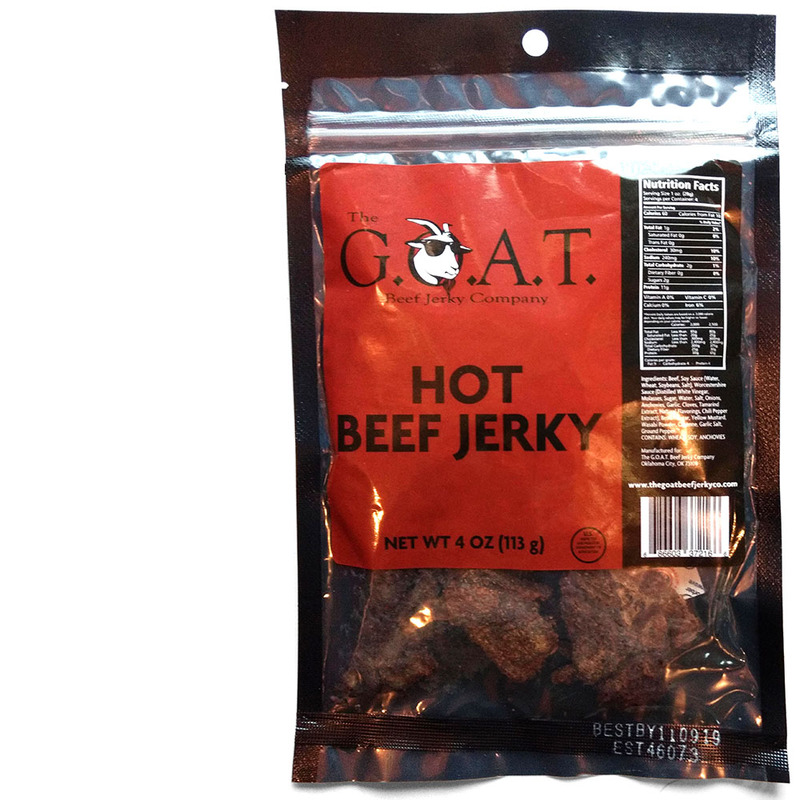 Beef Jerky Company delivers enough heat to let spicy food lovers relish the tongue-torching fun of chile peppers, yet still keep it dialed down to a level where meat snackers can feed this stuff into their face in conveyor belt-like fashion. The wasabi ingredient really makes this unique by adding a second-level of spiciness along with a unique style of flavor. 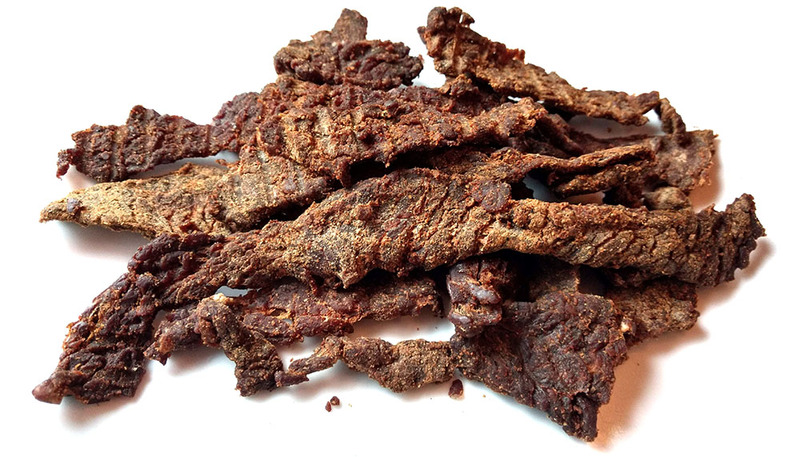 It's not that intense horseradish burn that rushes up into the nostrils the wasabi paste does on a California Roll, rather it's more of that characteristic pungent spice that compliments this jerky's Hot profile quite well. Overall, this jerky tends to rely on a very familiar and very well tested set of ingredients, and as such can often seem unremarkable in comparison to other gourmet brands. 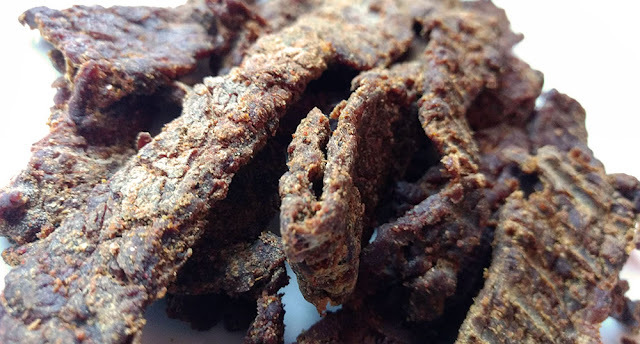 However, it's that injection of wasabi that really elevates this jerky to the level of unique and unexpected that makes it worth trying, at least once.